We’re huge fans of nutritious energy-boosting snacks. Sometimes it can be difficult finding healthy vegan snacks on the go (apart from fresh fruit! ), so every now and then we’ll make a big batch of protein balls and energy bars to take with us when we’re out and about. For these recipes, we turned to our friend Jason from Rawsome Hackney who makes the most ridiculously tasty vegan protein bites. Follow Jason on Instagram to find out more about his delicious snacks. 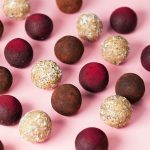 He popped into the So Vegan kitchen and showed us how to create his legendary lemon cashew coconut, almond-butter brownie and ‘Beet! It’ bites. They’re super easy and they’ll even last for a couple of weeks in the fridge. Add the cashews to a food processor and process until they reach a coarse texture. Add the protein powder, raisins, desiccated coconut, poppy seeds, millet, medjool dates, dried apricots, juice from the whole lemon and the zest from half the lemon to the blender, and blend until the mixture begins to clump together. Add a splash of water to bring the mixture together if it’s too dry. Roll the mixture into balls approximately 50g in weight. Pour a small amount of desiccated coconut, poppy seeds and grate the remaining zest from the lemon onto separate plates, then roll the balls in each topping. Serve immediately or store in an airtight container in the fridge for up to 2 weeks. Transfer the pitted medjool dates to a small bowl and cover with hot water from the kettle. Leave to soak for 5 minutes, then drain and set to one side. Add the almonds and walnuts to food processor and process until they reach a coarse texture. Add the protein powder, cacao powder, medjool dates, vanilla extract and salt to the processor, and process until the mixture begins to clump together. Add a splash of water to bring the mixture together if it’s too dry. Pour a little cacao powder onto a plate and roll each ball in the powder until they’re completely coated. Add the cashews, almonds and walnuts to a food processor and process until they reach a coarse texture. 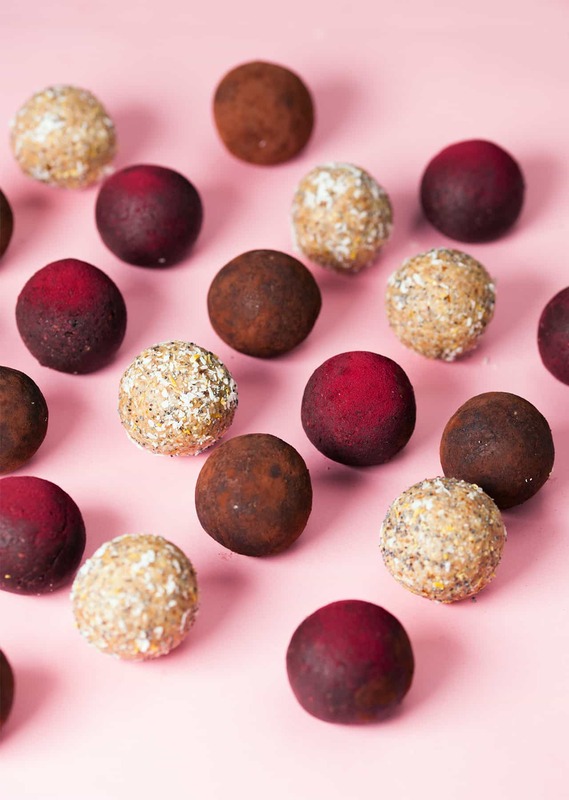 Add the cacao powder, protein powder, salt, beetroot powder, cinnamon, beetroot, medjool dates, pumpkin seeds, dark chocolate and vanilla extract, and process until the mixture begins to clump together. Add a splash of water to bring the mixture together if it’s too dry. Dust each bite with some beetroot powder to finish.